Are your boots rubbing you up the wrong way? Dr Suzy Stokes MBChB (Hons), DiMM, FAWM, MCEM explains the painful details. Blisters are the most common complaint of marathon runners and a common medical condition mountain guides requested further medical advice on. Apart from causing pain and misery, the breakdown of the natural barrier the skin provides renders the host susceptible to cellulitis (infection in and around the blister), blister related sepsis (infection spreading around the body) and thermal injuries (e.g. frostbite). Blisters caused by burning, freezing, chemical exposure, inherited dermatological conditions and infection are not covered here. Figure 1: An example of significant blisters. 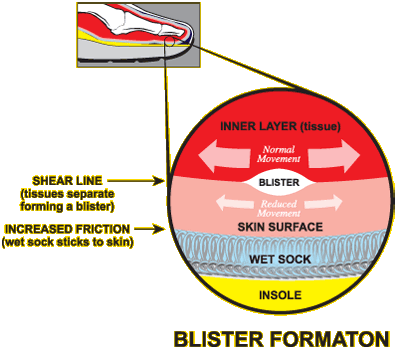 Blisters result from frictional forces (caused by repetitive rubbing) that cause separation of the skin cells at the layer responsible for the mechanical strength of skin. In the space that is created by the separation of the layers, fluid collects. Blisters form most readily on moist skin (e.g. sweaty feet) where the frictional forces (Ff) are greatest. Very wet or very dry skin has lower Ff and therefore blisters are less frequent. Blisters are most common on the hands and feet, where the thick top layer of the skin is held tightly to the underlying layers allowing for minimal pre-existing ‘give’. Healing starts at 6 hours and by 24 hours cell dividing begins and new skin cells are observed at 48-120 hours. This uninterrupted cycle of repair is rare in the mountaineering environment as often further friction is unavoidable if when walking or climbing is necessary. Healing can be markedly delayed if this blister site becomes wet, dirty or is not adequately padded. Blisters on top of other blisters can invade the deeper skin and are at higher risk of spreading infection. There is mixed opinion as to the efficacy of anti-perspirants, emollients and drying powders. Training exercises can allow for foot adaptation at areas of increased friction as repeated low intensity frictional forces causes thickening of the surface of the skin. Applying 10% tannic acid can also help harden the skin and using petroleum jelly reduces friction. Sock recommendations are mostly based on studies in army recruits, where it has been shown that it is better to wear two pairs of socks – with low friction against the skin (e.g. thin polyester sock) and high friction against the insole (e.g. thick wool or polypropylene). Recruits who had fewer blisters also had fewer other injuries. Comfortable well fitting shoes are of utmost importance ensuring that they have first been ‘broken in’. Taping susceptible areas of the feet can help prevent blisters. The material must have a very high coefficient of friction and may take the form of tape, bandages or specially designed plasters (e.g. Compeed). Identifying “hot spots” early and addressing the problem (e.g. changing footwear/sockwear/stopping activity and drying feet) may prevent blisters altogether. If it is feasible to leave the roof of the blister on, this is the ideal management as the blister then remains sterile and heals. Eventually the fluid is reabsorbed, new skin cells are formed and the dry top layer (that was formerly the blister roof) falls off. Often this is not possible as the blister either spontaneously ruptures, or pain prevents adequate mobility. If this is the case piercing the blister should be undertaken with a sterile needle, creating multiple puncture sites at the periphery of the blister and allowing the fluid to drain. The roof should ideally be left in place. Once the blister has healed, the dry top layer can be allowed to fall off or be cut off with sterile scissors. If the blister has spontaneously burst, the skin may have clumped to one side and be causing another area of pressure. If this is the case, sterile scissors should be used to remove the dead skin. The raw skin should then be dressed and allowed to heal. Some dressings e.g. “Compeed” are designed to be left on as the blister heals underneath. This may not be possible if continued friction on top of the plaster causes it to dislodge. Checking the blister/wound on a daily basis means that complications (like infection) can be picked up early. Pain killers may be needed especially in situations where continuation of activity is a necessity. When trekking, the first aid kit should contain individualised blister treatment material including plasters, moleskin/second skin/zinc oxide tape, sterile needles and scissors and pain killers. If it is feasible to carry a second lightweight pair of shoes for evening/campsite wear, welcome relief can be achieved from the offending footwear. Allowing boots and socks to dry over night will prevent cumulative damp creating a wet environment. Routine daily ‘foot check’ regimes can help to heighten awareness of blister prevention and identify small blisters before they become incapacitating. Pain – this can be severe, particularly if burst or open blisters are persistently walked on. Treat with pain killers and rest. Infection – local infection of the blister is more likely if the blister is de-roofed. Normal skin bacteria are most common e.g. staphylococcus. Although antibiotics do not speed healing, it is important to seek medical advice if the blister becomes more red and swollen, if the redness spreads away from the original blister site or if the person feels unwell (e.g. with fever). Sepsis – where a local infection in a blister becomes widespread - is extremely rare. Deeper blisters in a dirty environment, or those people with an impaired immune system, are more at risk. Expedition delay – progress along a route may be delayed if an individual or group is suffering with blisters. Elective delay (e.g. 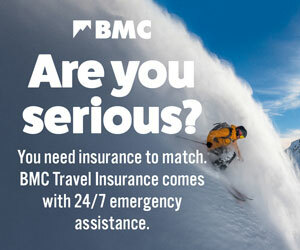 spending an extra few nights at base camp) is merely inconvenient, but emergency delay (e.g. stopping en route to treat severe blisters) may lead to hypothermia, group separation or slow progress meaning travelling in darkness. Expedition abandonment / Rescue – rarely severe blisters may render a trekker completely immobile or unable to tackle a technical descent. In this case it is safer to call for rescue for that individual or, when the group is small, the whole group may have to be evacuated. As other injuries are more common in those with blisters, overall risk of injury increases. A (above) – At 24 hours: Bilateral heel lesions induced by alpine mountaineering. The boots were well worn in, well fitting and had never caused blisters. The blister on the right heel had spontaneously de-roofed and was then covered with a Compeed. The blister on the left heel had ruptured, but the dead skin was cut away for comfort so that a dressing could be applied. B (above ) – At 0 hours: Left foot. Three distinct blister areas – the pad under the great toe where a blood blister formed, the posterior sole where shear forces had caused a large area of blistering with spontaneous de-roofing ( 6 x 6.5cm on left, 5 x 5cm on right) and the heel area. In conclusion friction blisters are a common problem for mountaineers and can mostly be prevented by appropriate footwear, socks and early identification of problem areas. All outdoor enthusiasts should be aware of the possibility of blister complications and consider casualty evacuation when pain prevents mobility (and there aren’t facilities for resting to allow healing), or where the casualty may be a danger to themselves or to the group if they were to continue. Adequately stocked personal blister kits are vital and early initiation of antibiotics should prevent local infections becoming systemic. Herring KM, Richie DH. (1990) Friction blisters and sock fiber composition. A double blind study. J Am Podiatr Med Assoc. 80, 63-71. Hillebrandt D. (2000) Medical educational needs of British mountaineering guides operating internationally. Pre-hospital Immediate Care. 4, 76-49. Hoeffler DF. (1975) Friction blisters and cellulitis in a navy recruit population. Mil Med. 140, 333-7. Knapik JJ, Reynolds KL, Duplantis KL, Jones BH. (1995) Friction Blisters. Pathophysiology, prevention and treatment. Sports Med. 20 (3), 136-47. Knapik JJ, Hamlet MP, Thompson KJ, Jones BH. (1996) Influence of boot-sock systems on frequency and severity of foot blisters. Mil Med. 161(10), 594-8. A very effective way to wear in a pair of hillwalking boots that I use is to wear the boots all day during the week when at work/university/college etc. Wearing the boots for a long period each day gets them shaped to your feet whilst walking only short distances and without heavy backpack will prevent formation of blisters. After a week or two the boots will be ready for trouble-free use in more serious conditions. Enjoy. After many years of mountaineering and many blisters Epitact has taken the number one spot in my first aid kit. In my opinion its the best thing since Friars Balsam! 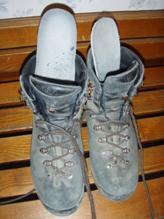 For multi-day hikes it is advisable to use boots 1-1,5 numbers bigger that your normal size. When the feet are 'locked up' in the small space of the boot, the swell in the body heat which increases the frictions. Blisters can be a pain. That's why proper footwear is always essential when hiking or even walking down the road. I rarely use creams apart from Solvaderm. But that's only for my complexion.